This multicolor pastel dotted cotton blend pantaloon set is made by Anavini, a leading manufacturer of quality smocked children's clothing. 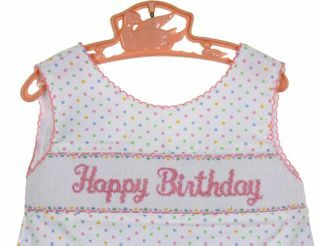 The white smocked swing top is embroidered with the words "Happy Birthday" in pink and accented with a hem ruffle. 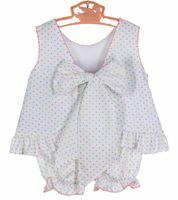 The sleeveless top ties in the back with a big bow and has a peekaboo back hem that allows the pantaloons to show. The pantaloons have an elasticized waist and leg ruffles edged with pink tatting. 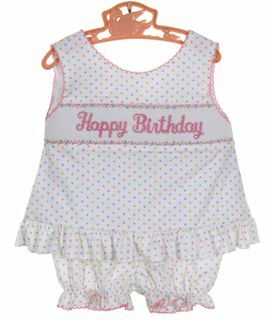 The perfect birthday outfit for your baby girl! 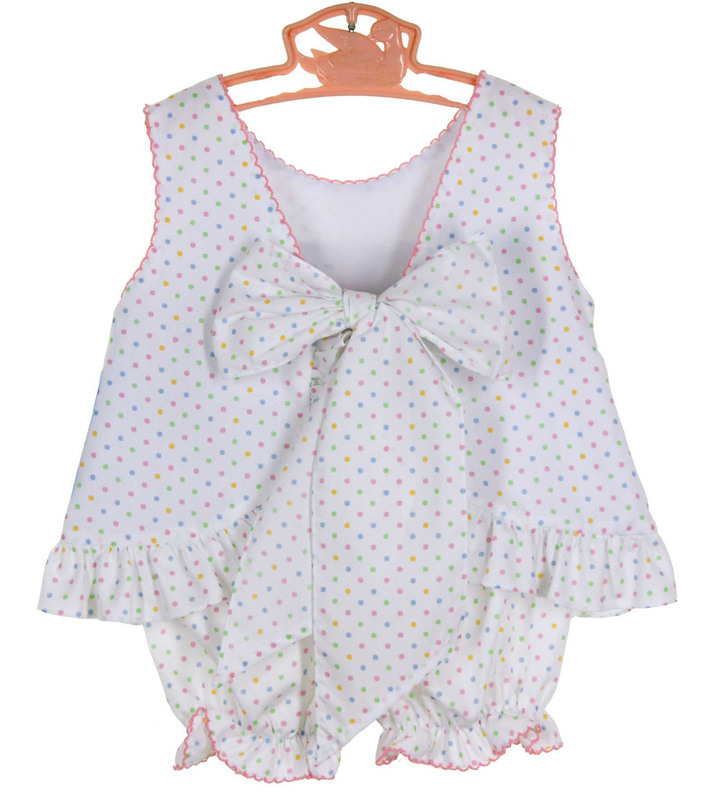 Matching bishop smocked dress and coordinating boys blue shortall are also available. See below. 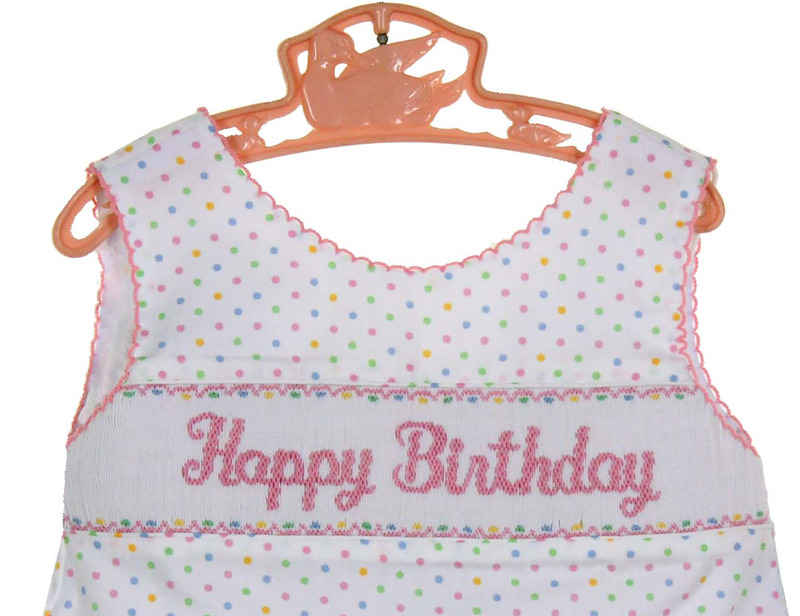 Grammie's Attic has the largest selection of baby girls' classic clothing and toddler girls' classic clothing, and little girls' classic clothing you'll find. Be sure to see all our beautiful dresses and outfits for portraits, parties, birthdays, and special occasions for your little girl from all your favorite manufacturers, including Polly Flinders, Feltman Brothers, C. I. Castro, Will'Beth, Petit Ami, Carriage Boutiques, Sarah Louise, Garden of Angels, Royal Child, Good Lad, House of Hatten, Rosalina, and many more.